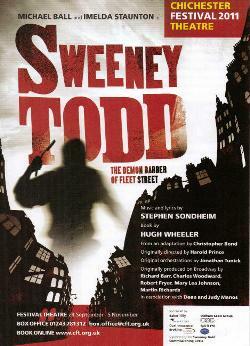 Chichester Festival Theatre has just released the full cast list for their production of Sweeney Todd which will star Michael Ball in the title role and Imelda Staunton as Mrs Lovett. It will run at Chichester from 24th September to 5th November with an anticipated West End transfer in the New Year. The full cast list is: MICHAEL BALL/Sweeney Todd: LUCY MAY BARKER/Johanna: JOHN BOWE/Judge Turpin: LUKE BRADY/Anthony: ROBERT BURT/Pirelli: GILLIAN KIRKPATRICK/Beggar Woman: JAMES McCONVILLE/Tobias: PETER POLYCARPOU/Beadle Bamford: IMELDA STAUNTON/Mrs Lovett and SIMEON TRUBY/Jonas Fogg. They will be joined by: VALDA AVIKS, WILL BARRATT, JOSIE BENSON, EMILY BULL, JOHN COATES, DANIEL GRAHAMROBINE LANDI, BRIAN McCANN, TIM MORGAN, ADAM PEARCE, VINCENT PIRILLO, WENDY SOMERVILLE, ANTON STEPHANS, KERRY WASHINGTON and ANNABEL WILLIAMS.